Welcome to Bill’s History Corner. For me, this is one of the more interesting invoices that we have in the Coppes paper collection. I love hardware stores, and this is from the HOWENSTEIN – BURBACK CO., successors. to HOWENSTEIN, BURBACK & RUSHER, dealers in HARDWARE, STOVES, SASH AND DOORS, PAINTS AND OILS, PLUMING, HEATING, ROOFING AND SPOUTING. This was a full-service store, located in downtown Nappanee in the same building that later housed the Martin Hardware store. This invoice covers the month of Dec. 1906. It looks like the store kept a running tab for the C, Z & M Co. business, then sent a “statement of account” at the end of the month. The actual paper invoice runs 17 inches long and fills two pages. We are only showing 25 % of the paper invoice this time. The items on the list are typical hardware items such 10 bolts @ .20 C. – 6-2in screws @ .02 – 1 tin pail @ .15 – 1 hand saw handle @ .10 – 8 doz. Cup hooks @ .27 – scoop shovel @ .80. What is difficult to see and understand is the column on the right side. The company charged each item into the correct business accounts. 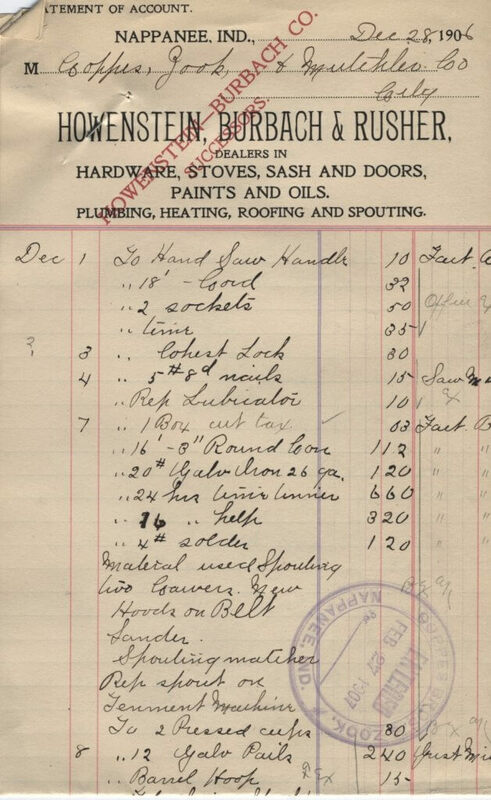 HBR charged some items to the sawmill, others to fact “B”, some to “Grist Mill.” The personal items purchased by Frank, John, or Albert were charged to their accounts. The total amount of purchases this month was $49.29 paid for by the company and then split into the right accounts.